When the wait was getting way too long for the fans to digest, here comes the most awaited first look poster of Thala 57. It will cease to be called as Thala 57 as the project now has an official title. Yes after a lot of speculations, this project has a formal name that we can call. Vivegam is the title of the project which means the ability to make proper and correct decisions even at the time of chaos. A title that pretty much suits the image of Thala Ajith; a title that perfectly relates to Ajith’s personal traits. So we directly give thumbs up to the title. Even the tagline 'Believe in yourself' suits well with Ajith's personal character. 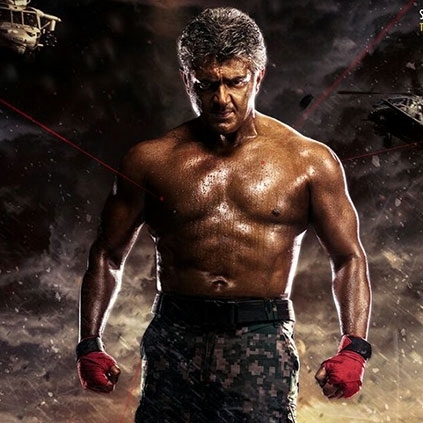 Coming back to the poster, Ajith is seen shirtless with built muscles. Maybe it does not break any rules. It might not be unique but when you have someone like Ajith in it, you hardly need anything else. When you see Ajith in six packs, clean shaven, salt and pepper look, nothing else matters. On the whole, the poster will satisfy all the Ajith fans. It is not just Jyothika, Samantha and Kajal??? More details here!! How did Kollywood react to Ajith's Vivegam first look? People looking for online information on Ajith, Thala, Vivegham will find this news story useful.